IPCC? 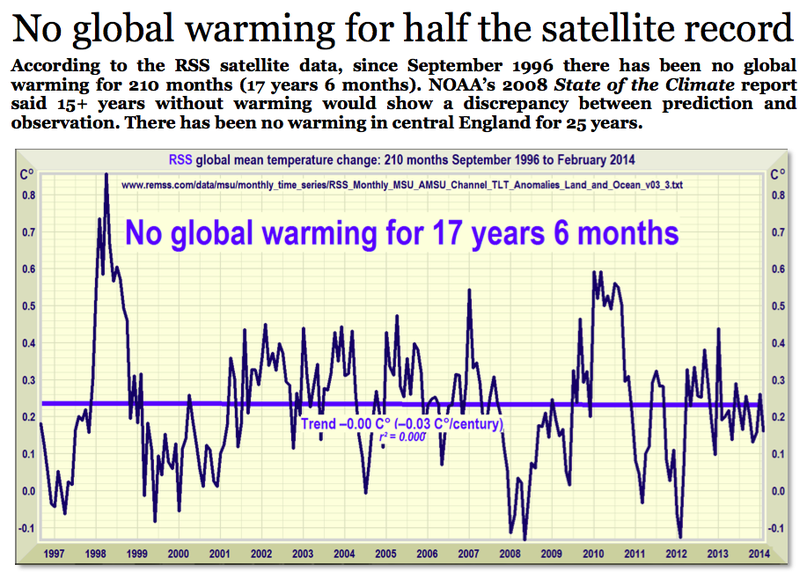 No Global Warming for Half the Satellite Record! 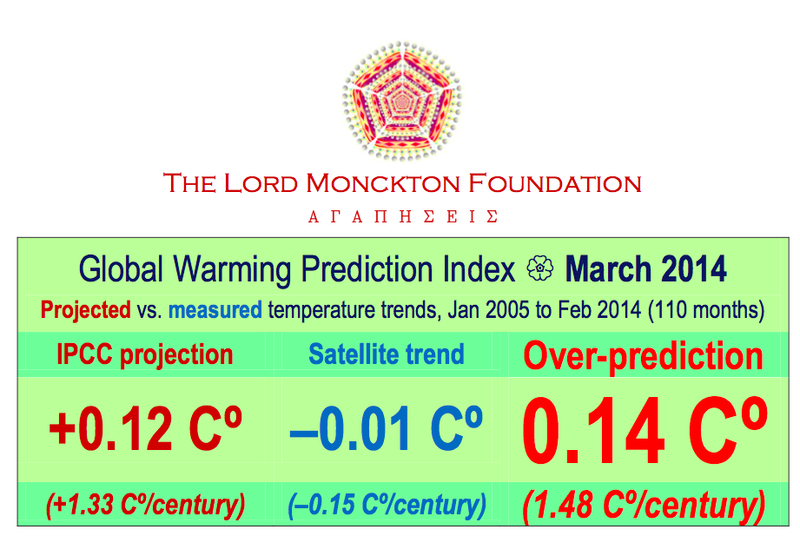 Around the tenth of every month, as soon as the satellite temperature data and CO2 concentration records for the previous month are available, the Lord Monckton Foundation publishes the Global Warming Prediction Index and its companion graph comparing modeled predictions against measured reality. The Foundation’s model takes full account of revisions to all data in the datasets. The Global Warming Prediction Index reduces to a single value a comparison of predicted global warming since January 2005 with measured warming. The monthly index number is the amount by which the IPCC’s central projection has overshot or undershot the observed temperature trend since January 2005. The monthly graph (example at left) displays the IPCC’s range of projections of global warming as an orange region (representing the region bounded by the two dark green trend arrows, below left) against the mean of the global mean satellite lower- troposphere anomalies from Remote Sensing Systems, Inc., and the University of Alabama at Huntsville (dark blue spline-curve overlying the bright blue least-squares trend-line). The CO2 concentration record (gray) is from Mauna Loa, Hawaii. 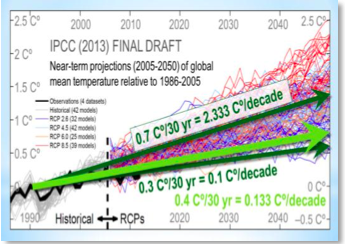 The IPCC’s Fifth Assessment Report (2013, Fig. 11.33a, left) backcasts to January 2005 the combined global-warming projections of up to 34 models under each of four radiative-forcing scenarios. Its range of projected warming, 0.3-0.7 Co over 30 years (equivalent to 1-2.33 Co/century), is at the low end of models’ projections. The lower bound of the orange region on the monthly Global Warming Prediction Index graph represents the 34 models’ low-end projection of future global warming: 0.3 Co over 30 years (1 Co/century). The thick, bright red line through the orange region shows the IPCC’s central projection: 0.4 Co global warming over 30 years (1.33 Co/century). The high-end projection of 0.7 Co global warming over 30 years (2.33 Co/century) is the upper dark red line on the monthly graph. Observed temperatures from 2005-2012 are shown in black in the IPCC’s spaghetti-graph (above). During the 2005-2012 training period, most of the models’ backcast projections are appreciably above observation. 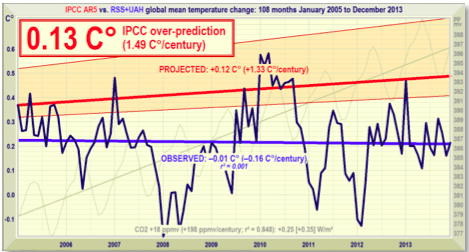 Note that the new projections shown by the green arrows are considerably below the projections in the pre-final draft of the IPCC’s Fifth Assessment Report, and signal for the first time a recognition by the IPCC that the models on which it had previously relied have consistently over-predicted global warming. Intergovernmental Panel on Climate Change, 2013 [in press], Fifth Assessment Report, §11.3.6.3 and Fig. 11.33a. National Oceanographic and Atmospheric Administration, 2013, Monthly mean Mauna Loa CO2 concentration: ftp://ftp.cmdl.noaa.gov/ccg/co2/trends/co2_mm_mlo.txt. Remote Sensing Systems, Inc., 2013, Monthly global mean lower-troposphere temperature anomalies: remss.com/data/msu/monthly_time_series/RSS_Monthly_MSU_AMSU_Channel_TLT_Anomalies_Land_and_Ocean_v03_3.txt. University of Alabama at Huntsville, 2013, Monthly global mean lower-troposphere temperature anomalies: vortex.nsstc.uah.edu/data/msu/t2lt/uahncdc.lt.